Aleasha Hladilek was working in a shop making futons, and discovered she liked building things and working with her hands. So, with her Bachelor’s degree in Anthropology, student loans, and dreams of owning a house, she decided to add to her skills and signed up for the welding program at a technical college. She’s been working as a welder for the last 11 years. 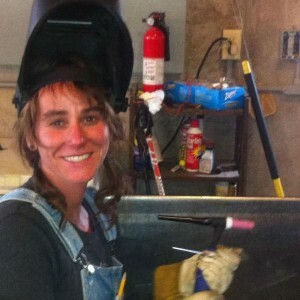 “My welding skills have kept me well employed and proud of my work,” she says. What welding process(es) do you use the most or feel more familiar with? Gas Tungsten Arc Welding and Shielded Metal Arc Welding, Aluminum wire feed. I teach a full time welding program, so I use and am proficient in Gas Metal Arc Welding, Flux Cored Arc Welding, and Metal Cored Arc Welding, but they are not my favorite processes. I teach a full time welding program at Wisconsin Indianhead Technical College. One of the best things about teaching is that I am constantly learning as well. I have my summers off and take other welding jobs to keep up my practice and also because I enjoy them. I’ve worked in a muffler shop GMAW, worked for the aerospace industry GTAW, worked for the Millwright union for paper mill and mine shutdown work SMAW, I work with a boat builder to build a 52 ft aluminum boat, I do truck repair for my neighbor’s logging company, and lots of art projects, for example the stage and beer taps at a local restaurant. Yes, I have. Although I can quickly prove my abilities the fact I’m female has been a challenge for some of my male co-workers. I have decided the best way to deal with it is call them out when the time is right. After I work with them for a while I earn their respect and hopefully change their attitudes. I work at a Technical College. I teach welding, but teaching has many different facets beyond welding. I also teach print reading and a study skills class. You have plenty of time to discover who you are and what you want to do with your life. Try everything and be open to new options. You’re education doesn’t only come from a four year college, it never ends. 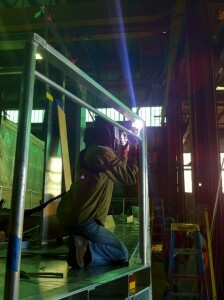 Welding takes practice, you will continually improve. Do not be afraid to be the only girl your class, you are valuable, and if you break out of limitations set by society you will find a place and job that you can be proud of. After finally completing my master’s degree in Career and Technical Education, I’m looking forward to earning my CWI this summer at the Hobart Institute of Welding in Troy! This entry was posted in New Rosies, TIG /GTAW Welding, Welding Education on March 18, 2015 by Carmen.